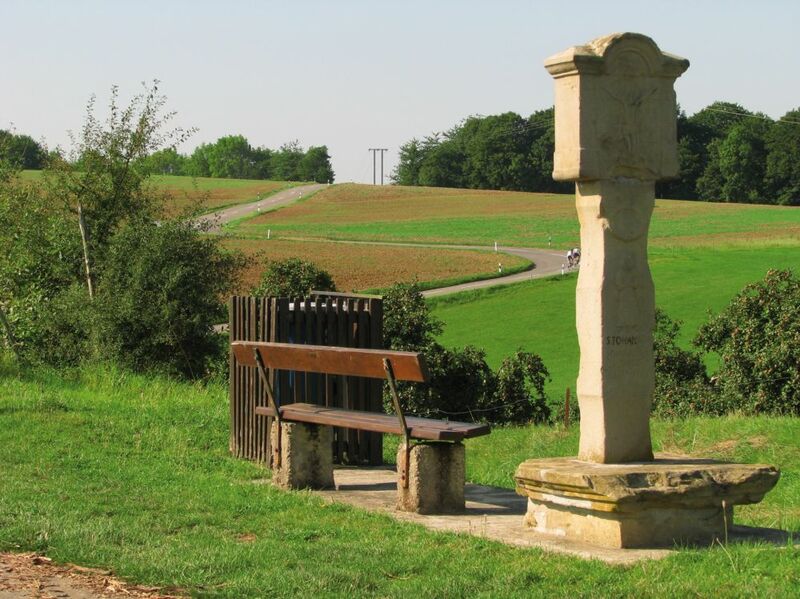 Welcome to the “Hoesdorf Plateau”historical circuit including the Siegfried Line (“Westwall”) and relating the dramatic events that took place in this area in 1944/45. What is now a small peaceful and pleasant landscape, was once the site of fierce fighting and human suffering. More details can also be obtained in the Historical Military Museum in Diekirch. The small village of Wallendorf (on the right wing) located across the Luxembourg-German border on the confluence point of the Sûre (Sauer) and Our rivers made the headlines in the wire services and the press, when shortly after the first U.S. troops had reached the borders of the “Third Reich”on September 11, 1944, strong elements of CCR (Combat Command R) of the 5th U.S. Armoured Division supported by subunits of the 112th Infantry Regiment (28th U.S. Infantry Division), pierced the “Siegfried”line and pushed in direction of Bitburg (Germany) capturing a number of villages as of September 14, 1944. This “high impact”action, initially crowned by success, met considerable enemy resistance around September 20 and had to be abandoned around the end of the month because lack of flanking protection and sufficient logistical support. In early October 1944 units of the 8th Infantry Division took over the former positions of the 5th U.S. Armoured Division, and established a number of observations and listening posts on the high ground of the “Hoesdorf Plateau”facing the wellcamouflaged German “Westwall”(Siegfried line) fortifications across the Our river. Around Thanksgiving Day (late November 1944), elements of the 109th Infantry Regiment (28th U.S. Infantry Division) after having suffered sizeable losses in the preceding “Huertgen”forest battle near Aachen, Germany, relieved the units of the 8th U.S. Infantry Division in the same sector and unfolded extensive reconnaissance and patrolling activity. From there on, the thinly-spread U.S. defensive line of the entire 28th U.S. Infantry Division stretched from the Sauer / Our river confluence point at Wallendorf to the Ouren/Burg Reuland sector, some 35 kilometres north, following the flow (in opposite direction) of the Our river. The 109th Infantry Regiment claimed responsibility of the greater Hoesdorf - Bettendorf - Longsdorf plateau with Wallendorf and Vianden / Stolzembourg as its sector limits. When in the early morning hours of December 16, 1944, strong German combat elements of the 352nd“Volksgrenadier” and 5th Paratroop Divisions crossed the Our river after a terrific 30-minute artillery barrage to attack the U.S. defence line, the prementioned sector became the site of deadly (often close combat) fighting with heavy losses on both sides. Making good use of the steep incline of the Our river valley, the outnumbered Americans were able to slow down the German advance until December 18 – 19, 1944, when after days of exhausting fighting, they were ordered to new defensive positions southwest of Diekirch and Ettelbruck. Although the enemy’s advance on the southern shoulder of the “Bulge”was stopped around Christmas, the German units kept control of the Hoesdorf - Bettendorf - Longsdorf plateau until the end of January 1945, when elements of General Patton’s Third Army (primarily the 4th and 5th U.S. Infantry Division) pushed them back to the initial December 16, 1944, jump-off line on the “Westwall”. In early February 1945, units of the 80th U.S. Infantry Division crossed the Our river from the Hoesdorf plateau angle, piercing the “Siegfried” line marking the beginning of the “Invasion of Germany” campaign. The map shows you the different starting points as well as the positions of the seventeen narrative panels put up all along the 21 km long footpath. The luxemburgish side comprises the panels number 1 to 9 and number 17 while the german side expands between the panels number 10 to 16. As a precaution please do not trespass the borders of the bunkers and stay on the marked ways. Please keep dogs on the lead. While touring this historical ground, please respectfully remember all those unknown who fought, suffered and died here – the opposed military and civilians caught in the crossfire.